Recent economic pressures and increased competition have placed many demands on PSOs. With pressure to improve profitability levels, many have been forced to lower operating costs and look for cost effective ways of retaining clients and gaining new business. 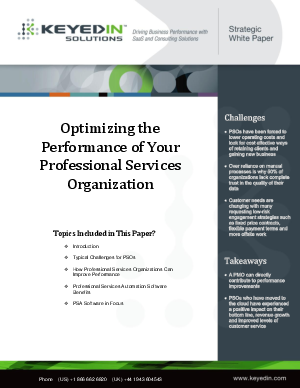 In this whitepaper, we outline the major challenges facing PSOs, how your PSO can improve performance, and some of the professional services automation (PSA) technology that can help you reduce waste, improve customer retention levels and boost your competitive edge.